Walter Butts, Poet Laureate of New Hampshire, died Easter Sunday, March 31st in Manchester NH, where helived with his wife, the poet S Stephanie. Before that was a ten year stay in Portsmouth NH, the small city he felt “at home.” He lived at times in Boston, NYC, Albany, and Rochester, NY. Born in Batavia (1944), and raised in LeRoy, NY by his father, Russell Marlin Butts and his mother, Ruth B. Bowerman Butts, the small town of LeRoy was an inspiration for much of his work. He attended several colleges, receiving his MFA from Vermont College of Fine Arts. Walter’s work and literary achievements were many. He taught writing workshops for children and adults throughout his life. He taught in formal programs such as Poets in the Schools in NY, and in many classrooms in Massachusetts and NH as well as informal workshops. He was a long time Assistant Professor of English at Hesser College in Manchester NH where developed a Film Studies program as film was one of his passions. The last five years of his teaching career were in the BFA program at Goddard College. He leaves many students and colleagues behind in that beloved community. He was nominated and listed several times in the Who’s Who Among American Teachers. Walter was a mentor to a number of writers. In his tenure as NH State Poet Laureate he followed Marie Harris, former NH State Poet Laureate in continuing her first gathering of the State Poets Laureate with a second gathering on Poetry and Politics. He served on the Portsmouth Poet Laureate Committee, was involved with the Center for the Book at the NH State Library, the Poetry Out Loud projects sponsored by NH State Council on the Arts, and numerous organizations over the years. Walter published many poems in small press and literary magazines of which he was a huge supporter including the Atlanta Review, Birmingham Poetry Review, Café Review, Cimarron Review, Mid-American Review, and Poetry East. His work is anthologized in Under the Legislature of Stars, The Other Side of Sorrow, Heartbeat of New England, An Endless Skyway: Poetry from the State Poets Laureate and others. He and his wife published and edited the literary magazine Crying Sky: Poetry and Conversation (2004-2007). Walter published several chapbooks and five full length volumes, including his new and selected volume, Cathedral of Nervous Horses from Hobblebush Books. He received several literary awards and acknowledgements, including the 2011 New England Book Festival Award for Poetry and the 2006 Iowa Source Poetry Book Prize. He was the recipient of two Pushcart Prize nominations, a Massachusetts Artists Foundation Award, and the New Hampshire Poet Laureate 2009 – 2014. Walter’s first full length book was published by Igneus Press of Bedford, NH. funnels light toward an unseen road. 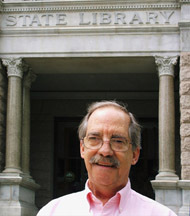 Photograph of Walter Butts by Keith Kuzmak. The biography of Walter Butts was extracted from his full obituary available here.